Google has given Google Play Music a bit of a makeover, and this one is more than skin deep. Yes, the new user interface has been given a fresh lick of paint, but the big changes are all lurking under the hood. The result being that Google Play Music knows your deepest, darkest secrets. According to Google, the new Google Play Music offers “a fresh take on our music streaming service that is smarter, easier to use, and much more assistive”. And these promises are all based on the machine learning that Google has built into the service. Machine learning is essentially a form of artificial intelligence How Intelligent Software Is Going to Change Your Life How Intelligent Software Is Going to Change Your Life Skynet is coming, and it's going to be incredibly popular. New AI technologies are emerging that will chance the way we live, play, and work, Read More which adapts as it receives new data. In the case of Google Play Music, this means the more you listen, the better the service will get to know you and your taste in music tastes. Or, as Google puts it, “your experience will keep evolving (and improving) as we get to know you better”. The new Google Play Music offers another neat trick; an offline playlist “based on what you’ve listened to recently”. This means that you’ll still be able to listen to music even on those rare occasions when you’re not connected to the internet. Unfortunately for Google, Google Play Music has two major problems… Spotify and Apple Music 10 Essential Apple Music Tips You Really Need to Know 10 Essential Apple Music Tips You Really Need to Know Since its launch in 2015, Apple Music has come a long way, baby. Unfortunately, it's still not the easiest or most intuitive service to get to grips with. Which is where we come in... Read More . These rival streaming music services already have millions of subscribers, and people aren’t going to switch without being given a damn good reason to do so. The question is whether this makeover, as impressive as it may be, offers enough of a reason to switch. Spotify already boasts some magnificent machine learning capabilities which deliver smart playlists Discover New Music with Spotify's Automagic Playlists Discover New Music with Spotify's Automagic Playlists Spotify has recently released several new ways of generating unique playlists that will help you discover awesome new music. We're here to guide you through these automagic playlist makers. Read More every week, and Apple Music has Beats 1 and Taylor Swift. So Google Play Music faces an uphill battle, especially as Amazon Music Unlimited is now also a thing Amazon Music Unlimited vs. Prime Music: What's the Difference? Amazon Music Unlimited vs. Prime Music: What's the Difference? In this article, we take a look at Prime Music and Amazon Music Unlimited to help you determine which one is right for you. Read More . 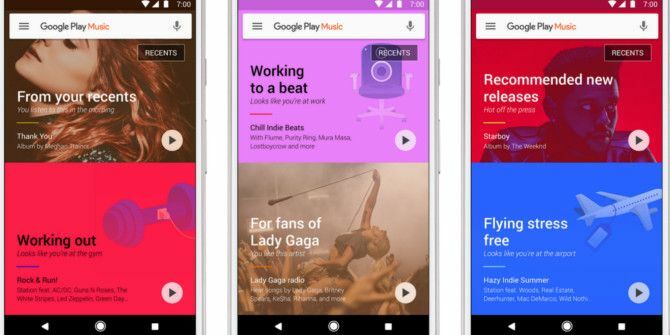 The new Google Play Music is already live on the web, and rolling out to the Android app and iOS app in the 62 countries where Google Play Music is currently available. Do you subscribe to Google Play Music? If so, what made you choose Google’s offering over the competition? If not, why not? What does Spotify, Apple Music, or Amazon Music Unlimited offer over Google Play Music? Please let us know in the comments below! Explore more about: Google, Google Play, Streaming Music. I've been using GPM for about 8 months now. Even though it's not as good as Spotify, it works for me. Plus, it comes with YouTube Red. I have been subscribing to Google music for about a year. I was dubious at first, having built up a huge i-tunes library over the years, but I found I was using my i-pod less and less. With Google Music I now listen to my own playlists as well as Googles daily offerings, which are pretty good - especially if like me, you like really cheesy music. There's a ton of music of there that's new for me as well, plenty of stuff that I would never have listened to normally. I like TWO of Nickelback's songs: Burn It To the Ground (was the Monday Night Raw theme for years), and When We Stand Together (played at every year's WWE Tribute to the Troops).